Lukaku (31 per cent), Marouane Fellaini (20 per cent) and Marcus Rashford (8 per cent). CSKA Moscow in the Carabao Cup and Champions League respectively – finding the net and being hugely influential in both games before going on to pick up the club's Man of the Match award, which is also voted for by Reds supporters on Twitter. 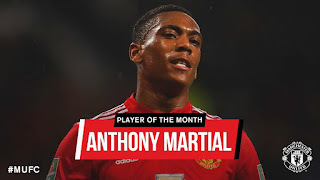 He also rounded off the scoring from the penalty spot in the 4-0 win over Everton and came off the bench to make his 100th appearance for United against Crystal Palace last weekend, marking the milestone by setting up Lukaku for the final goal in the Reds' victory by the same scoreline . The no.11 has impressed Jose Mourinho with his attitude this term and already has five goals and six assists to his name so far in 2017/18. It's the third time that the 21-year-old has won Player of the Month after also scooping the prize twice during his debut season, in December 2015 and May 2016.
claimed the accolade for August following a fine start to the campaign for the midfielder. Congratulations Anthony and thanks to everyone who voted!